They used it behind the sled, and they keep their valuable things in there while traveling –whatever they need, maybe lunch is in there, or dry fish and dry meat. This tanned moose-hide pouch was made to hang from the handlebars of a traditional dog-drawn Gwich’in toboggan or “big sleigh.” A row of red, pink, and black beads forms a decorative band along the edge of the bag, and around the flap are two rows of interlocking beaded triangles, separated by porcupine quill stitching. The tassels on the flap are made from beads and wool yarn. Narrow strips of caribou hide wrapped in quills make up the outer fringe. 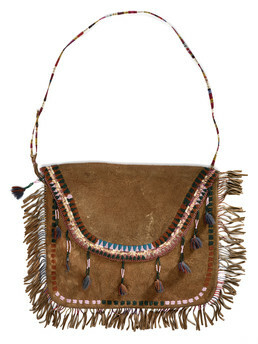 The shoulder strap is woven from dyed quills. Trimble Gilbert: You have quills on the middle, right here [edge of flap]. Eliza Jones: That looks very modern. Judy Woods: Yes, but they have this thing [shoulder strap] made out of quills, porcupine quills. Eliza Jones: Oh, my-my! Why would they make a string with porcupine quills. Judy Woods: I mean, that’s a lot of work. Trimble Gilbert: They break, you know. Judy Woods: They break is right. . . . Even the fringe has got it. Eliza Jones: Oh, wrapped with dyed porcupine quills. Judy Woods: Dyed porcupine quills and caribou trim this looks like. Eliza Jones: Mm-hmm. The beads don’t look as old as some of the other ones. Eliza Jones: So it’s more modern beads but lot of quill work. You see there’s two rows, two rows of quills. Judy Woods: . . . This [tassels] is old-time yarn too. Eliza Jones: Mm-hmm. That is old-time yarn. Kate Duncan: . . . Is the bag moose hide? Eliza Jones: They’re caribou. The fringes are caribou. Eliza Jones: There were sled bags that were beaded – not very much during my time, but I saw some old ones. And then there were what they call “wall bags” that were beaded. Eliza Jones: But I’ve never seen one like this, where it’s beaded like this and then a smaller flap. . . . Well, he [Trimble] could talk about dog bags and sled bags. Trimble Gilbert: Yes, lot of mushers long time ago using behind the toboggan. They use it behind the sled. And they keep their valuable things in there, and while they’re traveling whatever they need, and maybe like lunch in there and dry fish and dry meat. They just eat it right there. So I seen this kind on behind the toboggan, big one. You know the Archdeacon Stuck? Eliza Jones: People always mention that he had a really fancy beaded bag. Eliza Jones: It’s probably somewhere. Kate Duncan: Fairbanks. It’s in the book. Aron Crowell: Yes. Oh, that’s the one in your Gwich’in beadwork book. . . .
Eliza Jones: During my time, when I was a child and even today, we still make the sled bags but we make them out of canvas. It’s nothing fancy, because nobody’s fancy. Throw any kind of stuff in there. Phillip Arrow: . . . The ones I see is made out of canvas too. Put behind the sled. . . .
Trimble Gilbert: Well, my language is dinjik naagąįį [moose beads], naagąįį dinjik dhah khah tthaa [beaded sled bag made with ground squirrel]. Eliza Jones: Oh, khah tthaa [with ground squirrel]. Trimble Gilbert: Mm-hmm, khah tthaa [with ground squirrel]. Eliza Jones: Hutl edeełkoolee [sled bag]. Suzi Jones: When you were growing up, where did your mothers get their beads? Where would they get the beads they used to sew with? Judy Woods: I don’t know where they got them, but we used to buy them. . . . They were high [priced] at that time too. Old moccasins, if there was beads on it, we used to cut them off and restring them, wash them and then re-bead. Judy Woods; Reuse it again. Kate Duncan; Did they get to ask for different colors? . . .
Eliza Jones: You get what they have. Where I grew up was in Huslia, and as far as I know there was no store that sold the beads and even yarn. 1. In this entry, the Elders speak in different Athabascan dialects: Phillip Arrow, Deg Xinag; Trimble Gilbert, Gwich’in; Eliza Jones, Central Koyukon; and Judy Woods, Upper Koyukon.